Southern Gas Networks need to replace the final part of their gas mains on Upper Woodcote Road, which is scheduled to begin from Tuesday 7 April 2015, near to its junction with Woodcote Way. Phase 1 of these works will begin using 3-way portable traffic signals for approximately 2 weeks and will aim to be completed within the Easter school holidays. 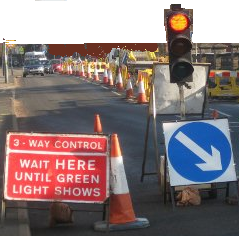 After this phase of the works is completed the works will be moving away from Woodcote Way and only 2-way portable traffic signals will be necessary to complete the remaining works. This phase of the works will take approximately 3-4 weeks to be completed, during which time the portable traffic signals will be manned throughout the peak traffic periods to avoid build-up of traffic. RBC will be notifying Reading Bus operators of the upcoming works shortly and residents have been notified and will also receive a letter drop from Southern Gas Networks contractors in the coming days. The works were postponed as the contractors working on behalf of Southern Gas Network had two crews allocated to this scheme, both of which left the company at very short notice and there wasn't adequate resource to replace them.